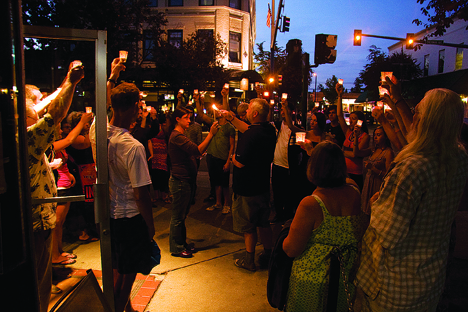 On the corner of Sherman Ave. and 4th St., Java on Sherman owners Dave and Lindsay Patterson take a moment of silence with Shana Ward’s friends and coworkers and lift their candles to the sky. In many ways, Shana Ward fit right in to Coeur d’Alene. She worked full time at Java on Sherman as a barista, where she made solid friendships with the owners, her coworkers and the customers. The 19-year-old went to church, read her Bible, and prayed. She loved running, and finishing her day by sitting down to write with a hot cup of tea. “Coeur d’Alene was her little heaven,” Andi Ward said. It was a ‘little heaven’ that ended too soon when Shana Ward took her own life on Sept. 5 in Coeur d’Alene. Her friends were shocked and saddened, her boyfriend and family crushed. Four days after Ward’s death, her friends, customers, and co-workers gathered together to take a moment of silence as the sun set behind the lake and mountains. Each person held a candle heavenward, honoring the life of Shana Ward. 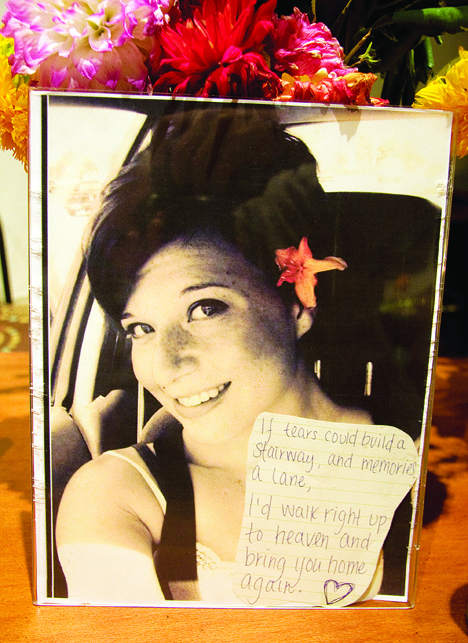 After the candlelight vigil, many shared something about Shana. They looked at her pictures, drank coffee, and ate lightly. People hugged, cried, and laughed. Each person had their moment to relive her life and to say goodbye. Ward, born and raised in Wyoming, moved to North Idaho with her boyfriend Charles White last spring from Arizona, where she briefly attended a massage therapy school. In the months before her death, she had a tight circle of friends in Coeur d’Alene. Many people were touched by her life. A cook remembers her hugging him when he was having a hard day. A barista recalls how she was too quiet, too meek, when calling out coffee orders. They were moved by how she smiled for every person, how she would willingly do a favor, how she could make someone feel so special in a single moment. They admired at her cowboy boots and sundress outfits, her quirky humor, her black coffee, and her admiration of goats and her dreams of going to South America, having a family and buying her first car. White sees how Shana’s own life is an example of how to help vulnerable people. 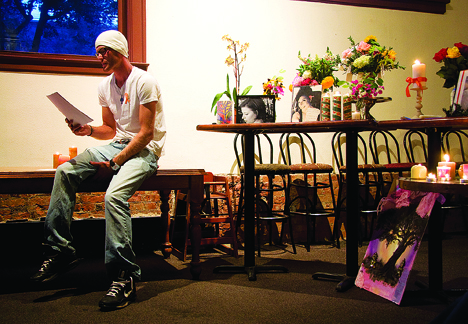 “Her words always had an impact on people, and her words made a great impact on the people at Java,” White said. “So when someone is telling you about their day, shut up and listen. You may give them the five minutes that save their life. For Java owners Dave and Lindsay Patterson, Shana Ward was “bright, beautiful, fun, and witty,” and they loved her. A friend leaves a hand-written note to Shana Ward at her memorial service at Java on Sherman. “She has brightened and saddened our lives, but more brightened our life with who she was. We are all better people for knowing her,” Dave said. Kate Nichols, a friend and coworker of Ward’s, shares the same age as Shana, 19. “Her spirit will always be with us here,” said Nichols. Java was a family to Shana, and continues to be a family to many others. Chanda Gingerich, 24, a coworker and friend of Shana’s, considers Java to be the place where she has spent her best days in life. In the months preceding her death, Shana was working on a book of her poetry. The poems are about her life, her relationships, her dreams, and her darkest days. Friends said her prose was a work of art. She finished it the day she died. Charles White wants to publish the poems to help people. “I knew her long enough to know how beautiful her soul was and how beautiful her heart was,” he said. A heartfelt story about an amazing person.